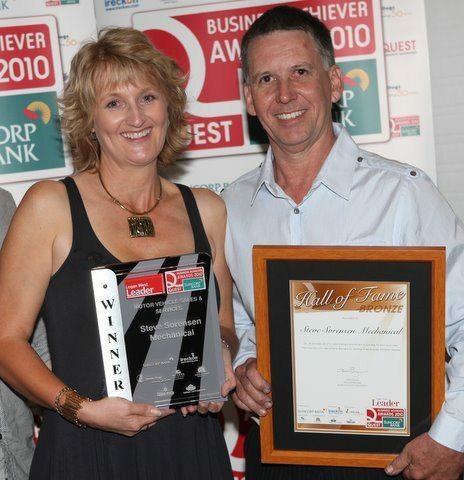 Our honesty and pride in our workmanship along with great customer service has been recognized by our customers with us winning the Quest Business Achievers Awards for outstanding service in the Motor Vehicle Sales and Service category consecutively for 5 years straight, also being inducted into the Quest Business Achievers Silver Hall of Fame. We have also received several “Word of Mouth” Service Awards for which we have our wonderful customers to thank, as they have placed many 5 star reviews online for us – read some of them here. We are very honoured to be the recipient of these awards and proudly display them in our local auto repair workshop in Browns Plains. They represent our hard work since opening in 1996, and determination to always offer the very best service. With our fantastic staff, we look forward to continuing to offer an economical alternative to dealership servicing for many years to come. We provide a range of services for our customers, from minor and major services to brake and clutch repairs, logbook servicing, road worthy certificates and much more. For a first class service and competitive pricing, call Steve Sorensen Mechanical – your local auto repair workshop on 07 3809 2711 or send us an email.